We wanted to update you on some changes that are occurring here at Remnant. Chris has been the main guy here on the blog, taking photos, finding furniture, blogging, social media, and posting furniture on etsy, etc. While, I (Heather) have been upholstering and working at a local sewing shop, Modern Domestic. It's amazing that Chris has been able to do as much as he does but it was clear that he needed some more help so that he wouldn't drown from the list of to-do's. So I handed in my notice to Modern Domestic (I'll miss those gals!! ), and I'm now 100% full-time Remnant employee. ;) I hope you'll enjoy hearing my voice here on the blog. My first assignment: improve our photography. For some time now, we had talked about our lack of photography skills, so I've been hitting the books and talking to other photographers. Our photography was so bad that we didn't even take pictures at Portland Flea because we would get the worst glare from the light coming through the windows. You could see dust spots illuminated from the lens. Not pretty! What a difference a good camera makes! We purchased our first dslr camera and at first, every photo was blurry! But now that I've slowly figured out many of the settings and am attempting to shoot in manual mode. It's not easy, but the photos are so, so much better! We had some gifts that would be perfect for Dad's and they all sold! Vintage coolers seem to be really popular right now and why not? They're tough, metal, and come in fun colors! At Portland Flea there are both inside vendors and outside vendors. Since we've been vending at the flea since the first flea, we always get the same spot inside. Vintage car show for Father's Day. It was a big hit! Our next event is the new market Sunday Emporium, on June 29th at Rejuvenation, 1100 SE Grand from 11-5pm. 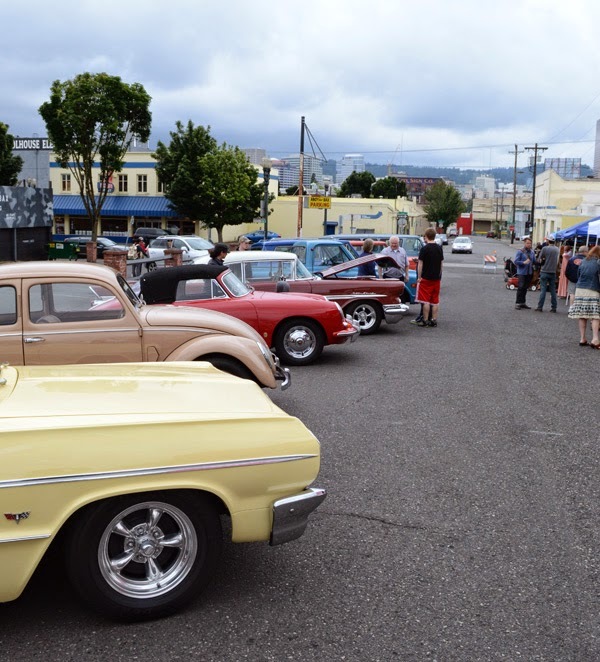 Make sure to mark on your calendar next month's Portland Flea: July 20th!